Located on highway 27 (just north of its intersection with US 192) Orange Tree is an exclusive private community and is ideally situated for those magical days at Disney. The mouse's home is only 8 miles away and it is just a short drive to the other major attractions. 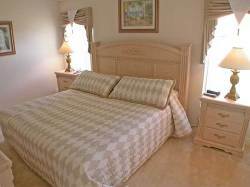 Two Master suites: 1 king-sized bed and 1 queen-sized bed, both large walk-in closets, the en-suites open out directly onto the Lanai/Pool/Spa area. Bedroom 3: double bed with walk-in closet. Bedrooms 4 & 5: with 2 single beds in each room and walk-in closet. Full bathroom between bedroom 3 & 4 and also adjacent bedroom 5. 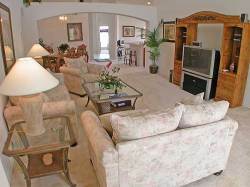 Great room/Dining room: Light and airy with cathedral ceiling with 3 large skylights and ceiling fan. A tastefully furnished lounge area with a 3-seater sofa (sofa bed), 2-seater love seat and armchair, coffee tables and lamps. 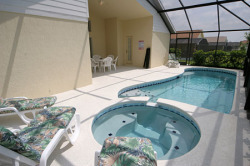 Direct access to the Lanai/Pool/Spa area. The dining area has a table and six chairs. Kitchen/Nook: The fully equipped kitchen offers every modern convenience. A table and four chairs provides a perfect breakfast and occasional eating area. Laundry room: Large washing machine and separate dryer, with ironing board and iron. 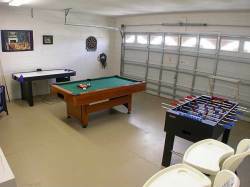 Pool/Spa/Lanai: Fully screened, south facing private 13' x 26' heated pool/spa. There is a covered Lanai. Between the Lanai and the pool is a child-safety fence. Sun loungers, patio set and gas barbeque are provided. The entire area is covered with a fine mesh screen.